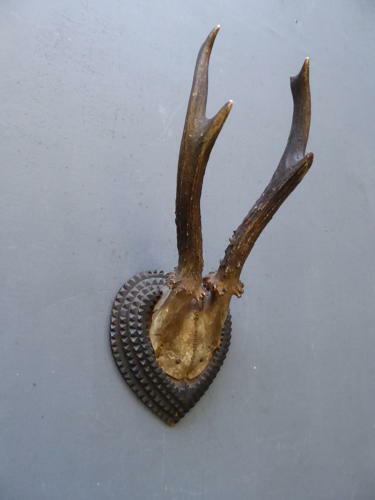 A beautiful set of antique taxidermy roe deer antlers on a tramp art mount. A small, beautiful & highly unusual piece of antique taxidermy featuring a heart-shaped tramp art mount, notch carved in the traditional manner & housing a small set of roe deer antlers. A wonderful piece a with good age related patina. Tramp art was made by untrained artisans during the 19th & 20th century & was made using easily obtained materials such as cigar boxes, natural wood & reclaimed fixtures & fittings. This piece is a wonderful & extremely unusual surviving example of such work. Wear commensurate with age as pictured, very good overall with one small chip to the top of the mount, just behind the antlers which does not detract.